Hundreds of pieces of postcard-sized artwork will be showcased at the New Mexico State University Art Gallery from Nov. 27–30 during a fundraiser to support the replacement of D.W. Williams Hall, the new art building which will provide an innovative and new space to support the needs of both the NMSU Department of Art in the College of Arts and Sciences and the University Art Gallery. 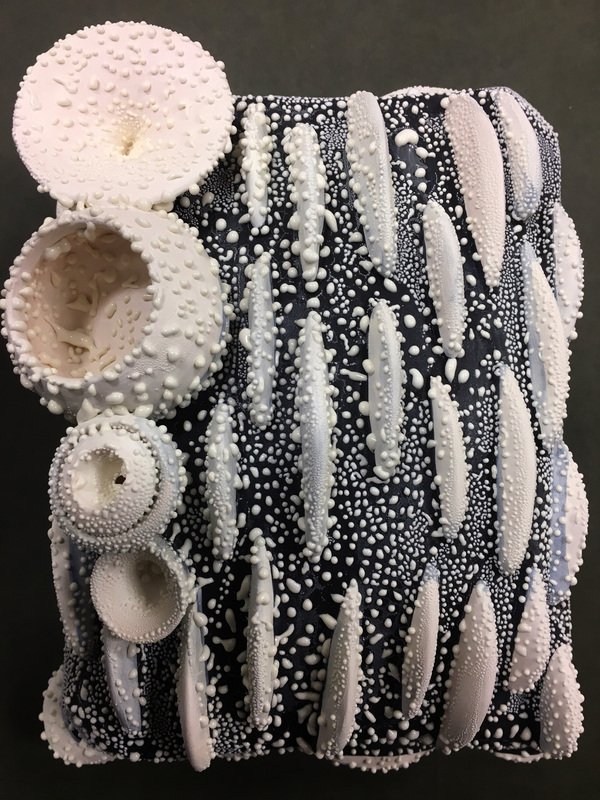 “Proceeds from “Project: Postcard” 2017 will support the Department of Art’s educational mission to provide an environment that facilitates collaboration and interdisciplinary crossover while fostering innovation, creativity, experimentation, and technical expertise,” said Julia Barello, art professor and art department head. 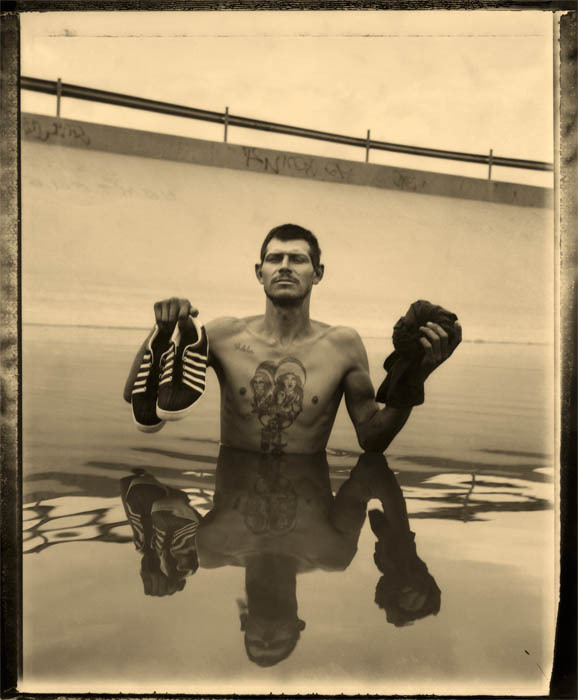 The exhibit will culminate with the art sale on Friday, Nov. 30 from 5:30–7:30 p.m. Event tickets are $40 per person and entitle the ticket holder to one artwork for each ticket purchased. The artwork has been donated and created by alumni, faculty and students, as well as regional, national and international artists. The 5-by-7-inch works of art will be exhibited anonymously and offered for sale. Tickets can be purchased at the NMSU Department of Art, in D.W. Williams Hall, Room 100 A. and the Cutter Gallery located on the corner of University Ave. and El Paseo. 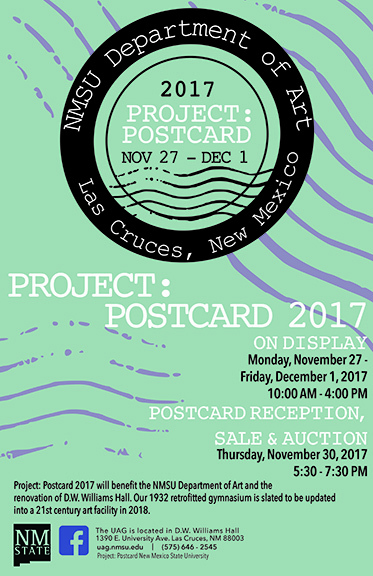 “Project: Postcard 2017” is sponsored by the Devasthali Family Foundation Fund, a fund in the Community Foundation of Southern, New Mexico. 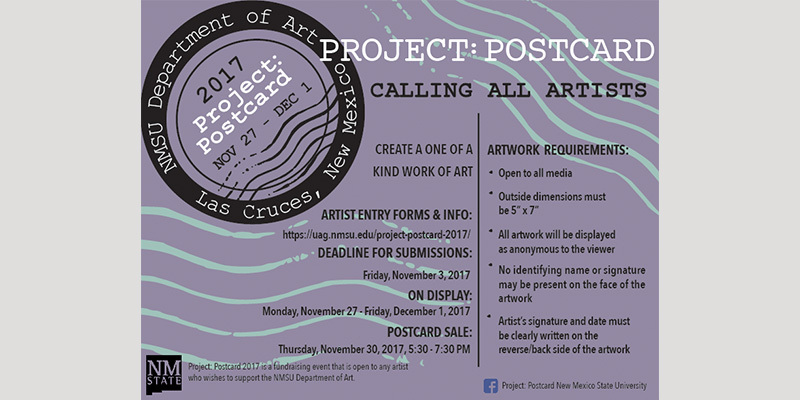 For more information about “Project: Postcard,” please visit: http://artdepartment.nmsu.edu or Facebook: Project Postcard New Mexico State University. This entry was posted in Call for Submissions. Bookmark the permalink. Follow any comments here with the RSS feed for this post. Both comments and trackbacks are currently closed. « Next Step: Giving Tuesday November 28th!! !